Add your URL to " Introduction to the Incas "
Who were the Incas and why are they so important to understand the Latin American history? First of all a little remark. The Incas are not all the people like we are used to understand if we talk about the Mayas or the Romans. The Incas are essentialy the leading class, the emperor's family that came into existance by the mythological ancestors and founders Manca Capac and Mama Occla. Because of the many children families had in these times and by elevating other families to noblicity because of their courage, cooperation or wealth, occupied this leading class the entire city of Cusco. The absolute leader of wich we would call him the Emperor, was called the "Sapa Inca", Quechua for 'the Only Inca'. His first wife was usually his full sister who was then called the Qolla and he married an extensive number of princesses who came usually from the Houses of the Sun (some kind of monestry) which helps explaining why the emperor and others from the high noblicity has such a great number of childeren. If we use the word 'Inca' we refere to this leading class families only from who the Sapa Inca was by far the most important member. In the beginning they ruled only over Cusco but in less than a century they controlled an empire streching from Quito (Equador) up to Santiago de Chile and Patagonia in Argentina. So to avoid saying every time 'the people ruled by the Incas' we will simply use the Quechua meaning "Sapa Inca" and his entourage. The Incas and what they once represented in world history is sadly underestimated by, and even unknown to, the western world. Although they have a lot to teach us on the fields of sociology, politics, religion and their overall cosmology. We only remember they were conquered by a handful Spanish soldiers lead by Francisco Pizarro, and that they owned 'mountains' of gold and silver as pieces of art in temples, palaces and many other places. We also know that the Incas left us one of the most important monuments to mankind, known as Machu Picchu and Sacsayhuamán. We can only guess about the beauty Cusco ever had, the capital of Tawaintisuyu, after the looting and burning down the city mid 16th century little has survived the test of time. Nevertetheless, a lot is still visable of their robust buildings Inca-style where on top the Spanish constructed their typical colonial houses and haciendas. These Inca-wall are earthquake resistant and has various times saved these Spanish houses using the Inca-construction as a foundation. The independance of the Incas in their evolution from any influence of the Western world can teach us a lot about how complex societies can evolve and be organized as also the wonderful inguinity in creating a balance between the different tribes putting together Tawaintisuyu. And there was not only this unity between very different people that were implemented in their empire, often without the use of war or corruption, they also created unity on the political, historical, artistical and cosmological fields. As a binding factor all these different tribes and people were united and inspired by their needs perfectly understood by the Inca-rulers. The Incas gave the newly addopted tribes the illusion they were send by the god of the Sun virracocha himself to unite all people and to bring peace in a highly-developed empire. They didn't achieve this only by words but of course by deeds, golden deeds, by wich many smaller civilizations voluntary joined the Inca-empire. Then a Virgin of the Sun was usually married to the chief of the tribe or civilization to mix their local blood with that of a divine source. It shouldn't be a surprise why the people of the Incas worshipped the Sun (the Inti) and saw the ruling class as a reflexion of the god of Creation, the Virracocha. commited atrocities like human sacrifices nothing more than stories brought home by the conquistadores just to justify their own crimes to humanity. Crimes that were backed-up by the Roman Church and in name of Christ that was in reality their furious search for gold and silver throughout the New World. Even today one can still recognize the struggle of the Indians against injustice brought to them by the "modern world", such as social inequality, poverty or simply the right to be an Indian as we see today asked by the Zapatistas in Mexico. A different kind of spelling often used is Tawanintinsuyu, in fact, this world is more oftenly used as Tawaintisuyu but we prefere the latter because it correspondents perfectly with the Quechua meaning of the word. The Spanish were masters in bastardizing existing words en toponyms to their own. 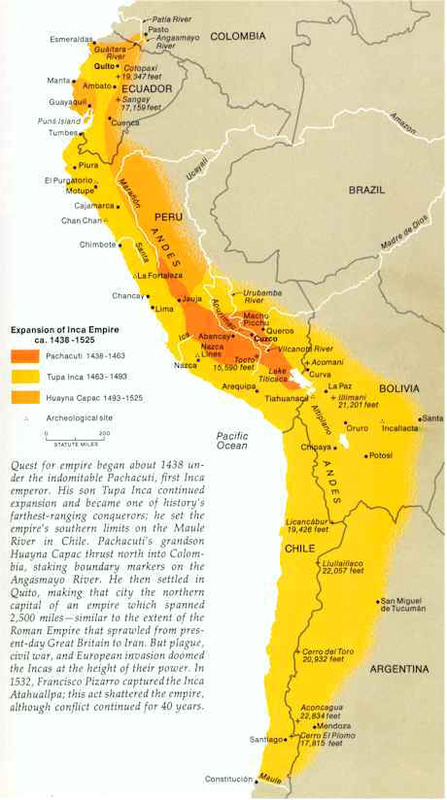 For example the name of the new capital city founded by the conquistadores: Lima comes from the name of the river running through it called by the Indians 'Rimac', and the name of the land itself: Peru, comes from the word they learned from the Aztecs: Piru, meaning 'the land of gold far south'. The four lands or provinces or Suyus were: Chinchaysuyu, Kontisuyu, Antisuyu and Kollasuyu. Chinsaysuyu is the part up to Equador, Antisuyu forming the border with the immence Amazon Basin, Kontisuyu was Southwest of Cusco up to the Pacific and South of Cusco up to the Lake Titicaca was Kollasuyu, including big parts of Chile, Argentina and the whole of Bolivia. In the centre of the four Suyus one found the mayestic city of Cusco from where the expansion of their empire began around 1438 by Inca Pachacuti. Where do we get the information from to reconstruct life and organization of Tawaintisuyu? The Incas didn't have a handwriting as we know it now but there were some ways of transferring and recording information unique to any other civilization, a kind of writing they have engineered to maintain their administration and to transport all kind of messages. All statistics were kept in Cusco, the Incas knew exactly who in the empire was doing what and what was needed to improve their system. For the administration the quipu was used to transfer all kind of valuable information. Another writing that hasn't been deciphered was the bean writing. Because the Incas didn't have a handwriting like we know it, they didn't keep any records of their history that can be understood by todays archeologists, it is very difficult to reproduce a chronological order of the history of Tawaintisuyu. Who were the founders and successors, how was it possible to expand their empire to such dimentions in less than 100 years? What is left for our times to help answering these questions are to many legends still kept and hand over to next generations in the high Andes and of course the writings of chronical writers (mostly monks) and the very important writings of the half-blood Spanjard Inca Garcilaso de la Vega in his book "Comentarios Reales". He was the sun of an the Incas-princess with the Spanish captain Garcilaso. He tells the story of what he still remembers of his childhood when he was still living in Cusco. He wrote the book between 1589 and 1616 when he died, in these times he lived in Madrid, his adult life in Europe brought him only desilusion and sorrow. He left Cusco as a young boy and never returned to his country of birth. The quipus were a very important way of communication to maintain the administration of the empire carried out in Cusco. The Inca-rulers knew exactly how many people lived where, how many land they needed for farming, how old every citizen was, etc etc. 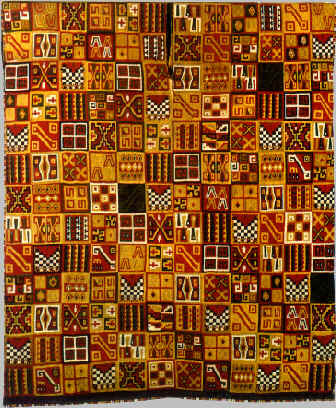 This very fine piece of textile was probably part of attire of an Inca noblicity. We can see the bean writings on it, as we found them also on vases, graves and inside pots writen on bean. Till today we still don't understan their meaning. Other significant chroniclers were Bartolomé de las Casas, Pedro Cieza de Leon and Cristobal de Molina. In later periods we find Pedro Sarmiento de Gamboa with his story about the history of the Incas. Because of the inquisition and the burning of books as a result of the people's revolt in Peru against the occupation, many writings were lost forever. The royal house in Madrid connected the writings of the Incas to what almost lead to a civil war and ordered the destruction of all works about their ancesters. Stories were forgotten, books were lost and archeology didn't yet exist. Only 400 years later a unique work of Garcilaso was found back in the state library of Danmark. Altough the "Comentarios Reales" is the best known and most refered work about the Incas, archeologists have modified and corrected a lot of Garcilaso's memories in recent times. For example, it seems that Garcilaso has shifted all the time the reign of an Inca with that of his successor. Because of this, all descriptions in his book are 20 to 40 years behind scedule. Garcilaso based his memories on what has been taught to him as a child by his uncle, who told the history of the Incas as generally accepted in Tawaintisuyu before the conquista, stories that contain more legends than facts. His uncle was the eldest and only survivor of the core of the Inca family who were all murdered by the Conquistadores in a matter of a few years. When Garcilaso was born, the Inca-empire fell in Spanish hands 6 years before that. To reproduce the history of the Incas and their meaning in Tawaintisuyu we will base ourselves on the excellent books of the Peruvian archeologist and historian Waldemar Espinoza Soriana, specially his book "Los Incas" and "La Destrucción del Imperio de los Incas". Los Incas tells about the history of the empire, how it all started, wich Incas ruled and what they did, how they organized society, politics, religion and expansion while "La Destrucción del Imperio de los Incas" tells the sad story of how the empire came to an end, starting with the civel war between the two brothers Atahualpa and Huascar up to the almost total extermination of a golden culture by the illiterated and brutal Spanish invaders. How did the Incas come to an end? How & where was the Incas civilisation formed? When did the civilisation begin & end? How did the civilisation come to an end? I hope you dont mind but i've used your website as part of my research for a school assignment. This information is very helpful and the pictures are great! Im doing a project on the incas and i need toknow what a good model is that i should do that i can do or make at home. Where did the Incas originate from? I need to know "What do we remember the incas for?" may you please help me find 4 reasons we remember them for thanks. I believe Andjela is right that this is indeed a "very good website with lots of useful information". However, I also appreciate the website's opinions and interpretations and suggest that the only "unbelievable crap" comes from Andjela. As a teacher of many years, I would hate to have read her student report.